Horace Mann School maintains a food service agreement with FLIK Independent Schools. Under this agreement, FLIK provides food service for HM at the Middle and Upper Divisions, the Lower Division and the Nursery Division campuses. 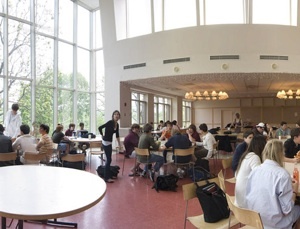 Dorr is not covered under the agreement with FLIK International; food there is prepared and cooked by students and Dorr faculty. FLIK hires food service consultants to maintain the highest standard of food handling safety and sanitation. Upon request, FLIK provides special food services for guests, conferences, parties, dinners, special occasions, and meetings. Menus are specially designed and reviewed by the FLIK nutritionist. Managers and staff are professionally trained in food preparation and handling. Our menu choices ensure the availability of healthy options for students and faculty. Whenever possible, food is prepared from scratch, limiting the use of processed foods containing artificial flavors, high levels of sodium, or preservatives. FLIK purchases only non-irradiated foods. All meats are graded “choice” or its equivalent. Dairy selections are low-fat and free of artificial hormones and antibiotics. Bananas and coffee are Fair Trade products, and organic and seasonal fruits and vegetables are purchased locally whenever possible. Students in grades three through twelve use dishwasher-safe tumblers, plates, bowls and flatware in support of the School's sustainability initiative. In the Middle and Upper Divisions, our dishwasher room is equipped with a "grinder" thus dramatically reducing the amount of solid waste heading toward landfills. All paper products used at HM are made from 100% recycled materials, and the disposable flatware and plates are made from sustainable and biodegradable materials.